This simple, refreshing salad is perfect for picnics or any summer meal. In a large mixing bowl, gently toss together all of the ingredients. Add salt and pepper to taste. Let sit 10-15 minutes before serving to allow the flavors to meld. This chopped salad is amenable to all sorts of variations. 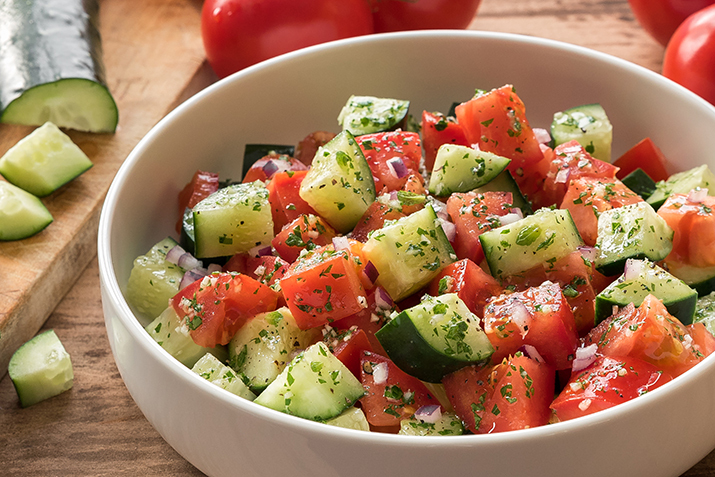 Add Kalamata olives, feta cheese, cubes of watermelon or cantaloupe, or just about any other seasonal diced veggies you like. Serve on a bed of fresh spinach or cooked leftover grains.